Congress is getting closer to passing a major tax overhaul -- but we're not there yet. The Senate passed its bill during the early hours of Saturday morning, in a largely party-line vote. But it differs from the House bill passed in mid-November. Now, the differences must be reconciled before a final piece of legislation is voted on by both chambers. Congressional leaders are rushing to get it done all before the end of the year. It's hard to keep track of what's in each bill, but we broke it down for you. There are some proposed changes that are included in the House and Senate bills. Both would affect homeowners, for example, by killing the state and local income tax deduction and limiting property tax breaks. And both would cut the corporate tax rate. Read this story for a detailed rundown on what's in the Senate bill and how it differs from the House bill. You'll be hearing a lot about how the two bills differ in the days ahead. CNNMoney's Jeanne Sahadi lists 13 notable ways they diverge, which could affect your wallet. 1. 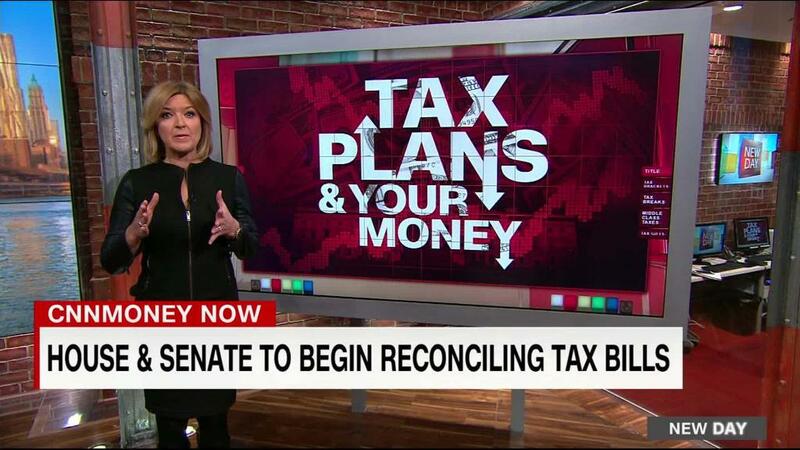 Both bills would increase the standard deduction -- but by different amounts. 2. The House bill limits the mortgage interest deduction, lowering the amount you can deduct to $500,000 from $1 million currently. The Senate bill keeps it as is. 3. Both bills expand the child tax credit -- but by different amounts. It's hard to determine how many Americans would see a tax cut under the plans. But one estimate says that middle-income groups would see their after-tax incomes rise on average, though those increases would be mostly modest. One thing is for sure, many Americans could certainly benefit from putting aside some extra money in their savings accounts. We're still among the worst savers in the industrialized world, and about 44% of us say we couldn't cover an emergency expense costing $400. Here are three financial tools that can help you take control of your saving and tips on how to get out of the overspending trap. Tax return fraud is one of the most prominent forms of cybercrime. Criminals get a hold of your personal information so that they can file your tax return before you do and steal your refund. Brett Johnson stole more than $300,000 by stealing tax refunds before he served six years in prison on charges of fraud. Now, he tells CNNMoney about how you can protect yourself from identity theft.